Special religious education (SRE) in New South Wales is celebrating a resurgence in support and recognition after a successful event in parliament house endorsed by both the Government and the Opposition. The event was the release of a ground-breaking independent report into special religious education (SRE) in NSW schools which finds that SRE brings important psychological benefits to students’ mental health and wellbeing and reduces the risk of mental illness. Report authors Professor Zehavit Gross, the UNESCO/ Burg Chair in Education for Human Values, Tolerance and Peace, Bar-Ilan University, Israel and Professor Emerita Suzanne D. Rutland spoke at the event witnessed by both education minister Rob Stokes and shadow education minister Jihad Dib. 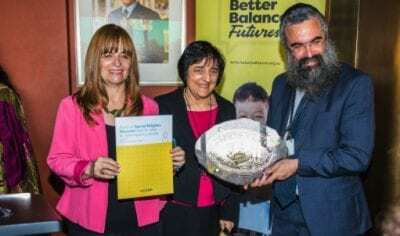 It was also a momentous occasion because in 2018 SRE is supported by all faiths, both the Government and Opposition and the department of education, for the betterment of young children and teenagers. As a further reflection of the bipartisan nature of the event, the minister also thanked his opposition colleague and education spokesman Jihad Dib and all his parliamentary colleagues. Member for Lakemba and opposition education spokesman Jihad Dib spoke of the multicultural society that we share in Australia today and how all faiths helped shape him. All speakers recognised the many contributors to the success of SRE today in NSW schools and many were officially recognised at the conclusion with awards for their excellent service.